I’m not an artist. Just a mom of three. The only art I see, honestly, are the crayon drawings on my refrigerator door and sculptures made of Play-Doh. I couldn’t tell a watercolor from a pastel, a Carravagio from a Rembrandt, art deco from pop art. But … I am noticing lately, an art that pervades my life, every waking hour of it. Have you seen a 4-year-old play tea party, pour what’s not there, drink what’s invisible, and strike up delightful conversations with her dutiful but sweetly mismatched love-worn company? 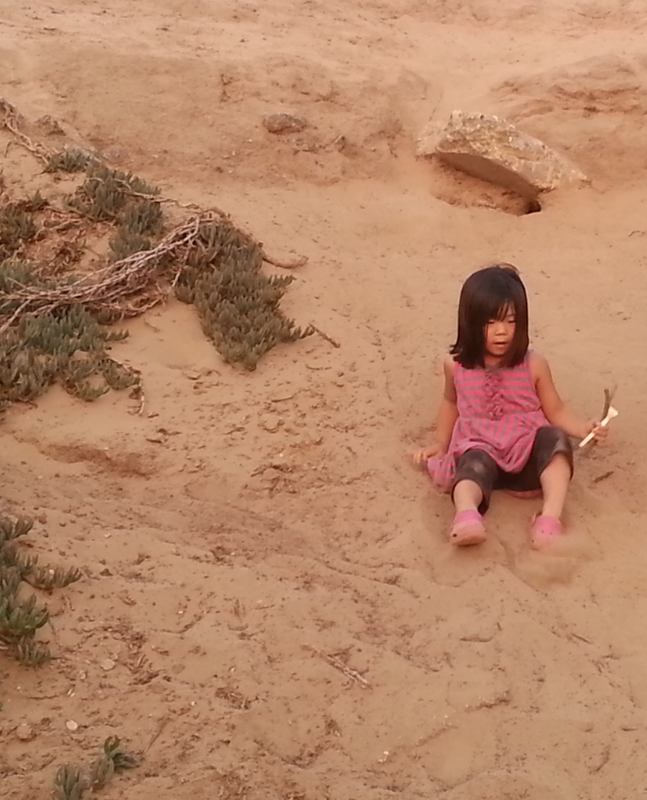 Have you seen a child scale a dirt mound? The way she climbs and slips, her knees bravely to the dust, dust all in her shoes, dragging a mesmerizing trail of swirls and streaks in the earth? Have you seen a cardboard box rocket through the galaxy, sail across the ocean, race in the Grand Prix, provide a home for a heart-broken teddy bear? Have you seen this kind of art? The satisfied smile of a ten-year-old as he builds Lego creations, a hundred different genius ways, unbridled by instruction and practicality? The look of pure confidence in the eyes of an eight-year-old as he strategically sets up a squad of miniature army men around pillows and other random items on his bedroom floor, in order to save the world from wild enemy forces? Framed only by imagination, motivated by this simple permission to be wholly content in our uniqueness, undisturbed by audience and the need to be art? Art that almost seems to echo, in a small and imperfect way, the effortless beauty of the One who created everything out of nothing? Have you seen this art of playing? I’m beginning to think it can still be everywhere. Because perhaps, it’s still in us, after all. What art do you see in your everyday life? Children playing really is an art, you are right! They have such a vivid imagination it is so fantastic! Yes! Vivid imaginations for sure. Thanks for commenting! I don’t have kids but I can still relate to this because my dogs. Please don’t take offense at that…I know dogs are not people but they are all I’ve got at the moment…LOL! Thanks for this post. It’s a good reminder to take time to play. Life is short. I love this comment! I miss having a dog … had two as a child and they were part of the family … they got Christmas gifts and everything. 🙂 I am a dog lover myself and can attest to their playful, free and accepting demeanor. 🙂 Please go hug your dogs for me! Love this Kim! I love watching my kids totally absorbed in their play. Having to actually play with them though? Not so much. Something about that makes my eye twitch and my skin itch. Haha. Oh I miss watching a toddler play. I love that your son plays the piano, the kazoo and the drums!! Music is huge in our home too! What a great perspective Kim! I am just like you, not knowing a fake from the real piece. However, I too am blessed with art each and every day. We are blessed with art everyday! Messy yet amazingly beautiful art! So sorry for the super late reply Sasha!